The 2008 Election "Obama Vs. McCain" tshirt wars are on. I've found that there are just as many Political humor apparel for adults as there are for kids,babies and even pets! 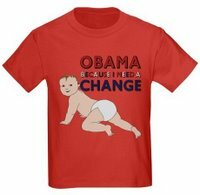 I came across this website www.cafepress.com that had a huge selection of "Obama" and "McCain" tshirts for kids. Is it a good thing to mix kids and politics? I don't know, but I would have no problem putting one on my strong headed, independent 2 year old daughter. Make sure you register to VOTE!